LIZ STUBITS OF L&B Tack safely slides into third base in the fourth inning of Wednesday nights Sullivan County Womens Softball League game as Charlies Angels third baseman Shannon Dietrich holds the ball in her glove. Stubits was declared out seconds later because the umpire ruled that she had left second base too early while tagging up on a fly ball. 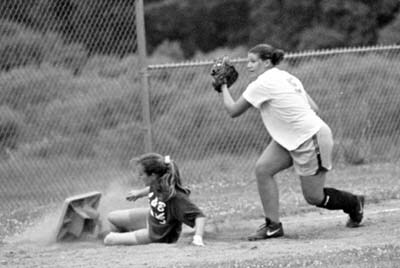 SWAN LAKE  July 9, 2004  The Charlies Angels softball team continued its winning streak on Wednesday night. Charlies Angels grabbed an early lead against L&B Tack and went to record a 9-1 victory in a Sullivan County Womens Softball League game the Swan Lake Firefighters Max Eronimous Field. With the win, the Angels improved their record to a perfect 15-0 this season. L&B Tack fell to 9-5 on the year. Charlies Angels wasted little time in getting on the scoreboard. With two outs in the top of the first, Tonya Martin ripped a single back up the middle to score Christine Decker from third base. In the top of the second, the Angels extended their lead to 3-0. Debbie Ackerley led off the frame with a single and Karen Fisher followed with a double to left field. Ackerley scored on a sacrifice fly by Cindy Ellmauer and Fisher crossed home plate on a single by Shannon Dietrich. After holding Charlies Angels scoreless in the third and fourth innings, L&B attempted to rally in the bottom of the fourth. The first batter of the frame, Liz Stubits, reached base on an infield single and Janet Calangelo followed with a base hit to put two runners on with no outs. The next batter, Laura White, hit a fly ball to left field and Stubits tried to tag up and advance to third base. Stubits safely slid under the tag of Angels third baseman Dietrich. But Charlies Angels appealed the play, arguing that Stubits had left second base too soon. The umpire agreed and called Stubits out, which was the second out of the inning. Instead of having two runners on base with only one out, L&B had one runner on with two outs. However, that one runner, Calangelo, scored when Maureen Johnson smacked a double to center field. Charlies Angels pitcher Lisa Krom then got a strikeout to end the inning and preserve her teams 3-1 lead. The Angels quickly extended that lead in the top of the fifth. Dietrich led off with a triple to right center and Terri Hess followed with a single to left field that allowed Dietrich to score. Later in the frame, Hess scored on an RBI single by Leanne Mangabang to give Charlies Angels a 5-1 lead. The Angels added some insurance runs in the top of the seventh. With two outs and two runners on base, Decker hit a bloop single to center field that allowed Robyn Gannon to cross home plate. Two batters later, Martin patiently drew a walk with the bases loaded. Jo Walls jogged home on the play to give Charlies Angels a 7-1 lead. Krom then hit a two-run single to center field to end the scoring. They got base hits when they needed them, L&B Coach Greg Merton said of Charlies Angels. Walls, who is the Charlies Angels player/coach, noted that her teams balance was a key to the win. In a game Tuesday night at Swan Lake Firefighters Max Eronimous Field, Charlies Angels defeated Cooper Paint by a final score of 15-2. Mangabang and Martin each had two RBIs in the contest. Anna Tesseyman scored four runs for the Angels. Fisher added a triple and Linda Schwartz picked up the win on the mound.